While the reality is perhaps a little less dramatic, it’s a damned handy device, providing fire, and at an efficient return for the fuel used. You can feasibly boil a pot of water with this thing using just twigs, sticks and pinecones! 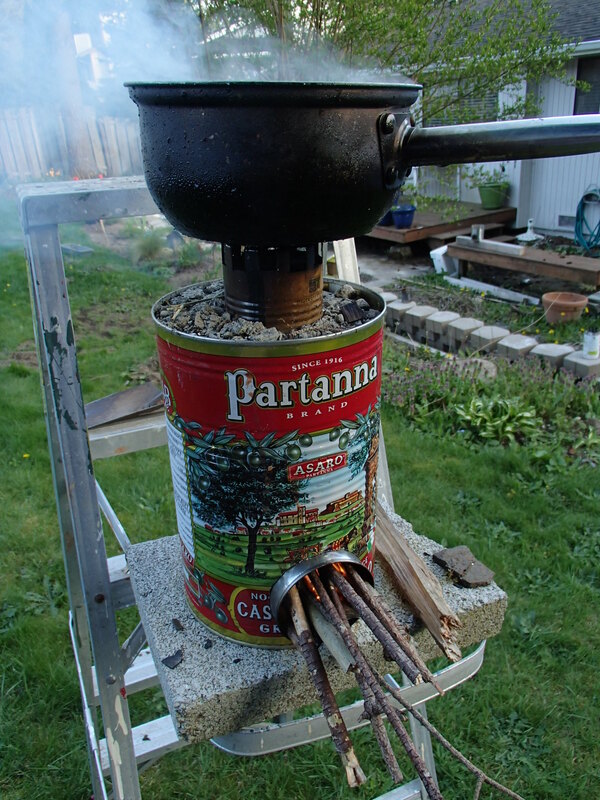 If you are a backyard tinkering type, or are leaning that way, the rocket stove concept can provide many hours of DIY engineering fun, if not just give you something to do. The feeder stacked to the gills! The Hobo stove has been around at least as long as the steel can, and most likely even longer than that. The concept is simple; an enclosed space, adequate airflow, and a surface on which to cook. 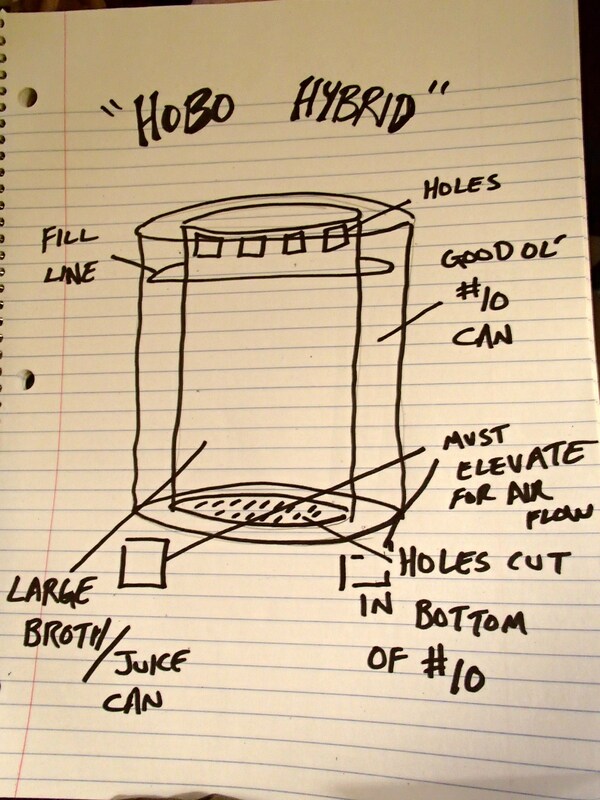 Coffee cans, paint cans, 55-gallon drums… basically anything can be used to construct a “hobo” style design. A charcoal briquette fire starter is essentially the same thing as a hobo stove but with a handle added. 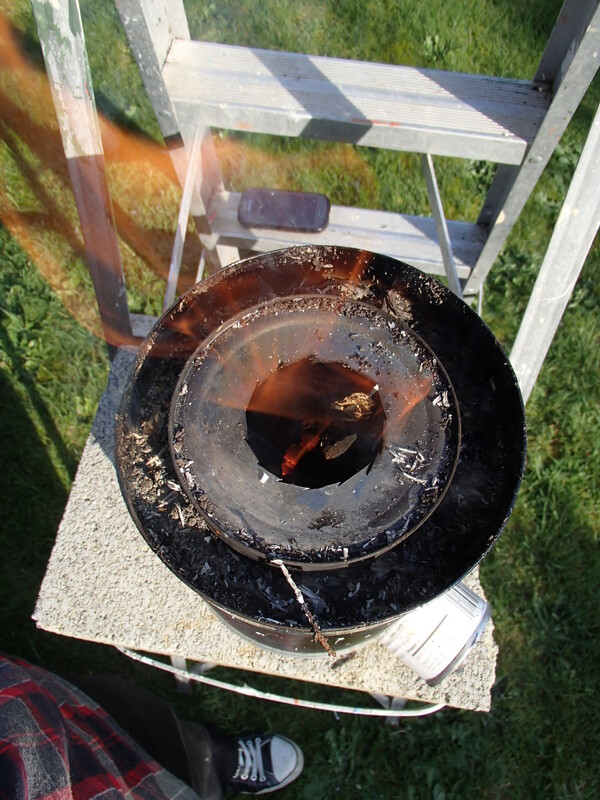 Hobo stoves are far more efficient than a campfire to cook or boil water, and due to the ubiquitousness of the materials, cheap or free to manufacture. The Rocket stove is defined by it’s “J” shape configuration, consisting of a feeder, burning chamber and vertical chimney. 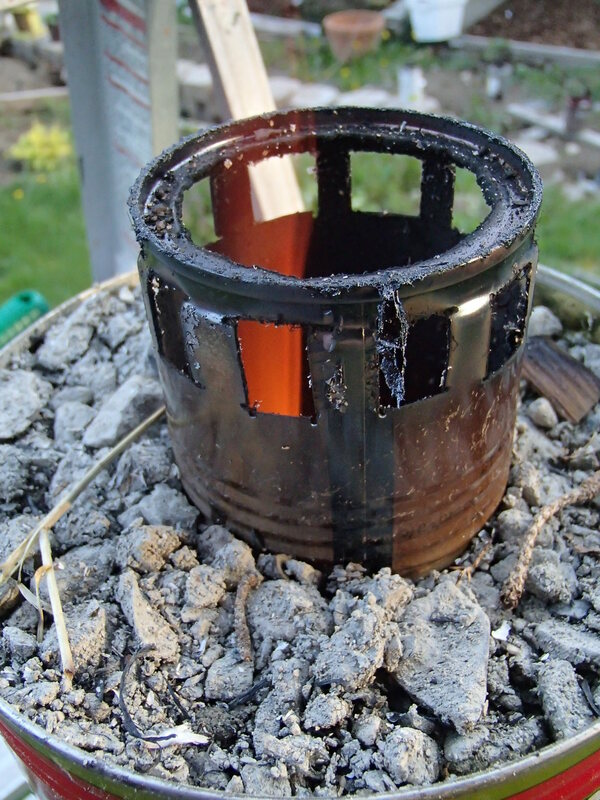 In the 1980s a Dr. Larry Winiarski began developing the Rocket stove based upon other earlier designs, which even included a Roman design known as a hypocaust, which the Romans had used for cooking and heating. 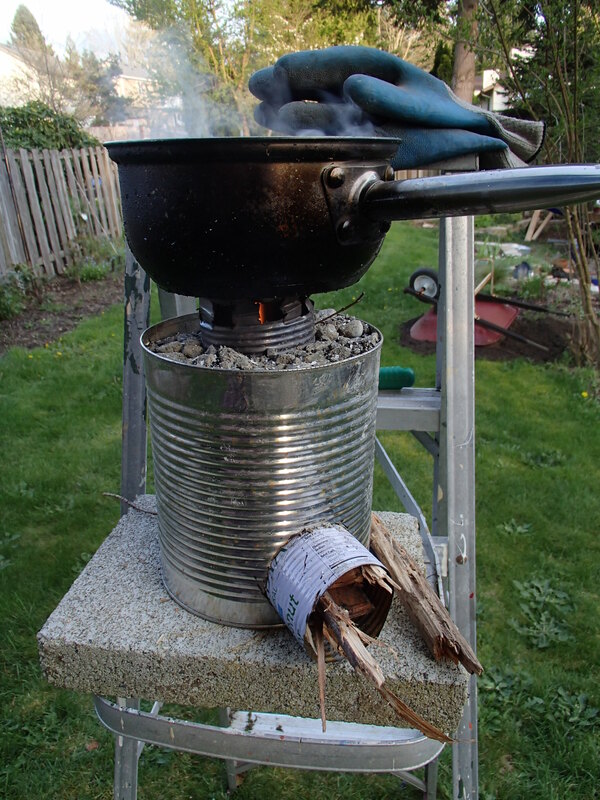 Today rocket stove designs are used in many parts of the world where economic and/or resource limitations make other means impractical or impossible, and I’d say it’s safe to assume that the good ol’ trusty hobo stove is working right along beside it. 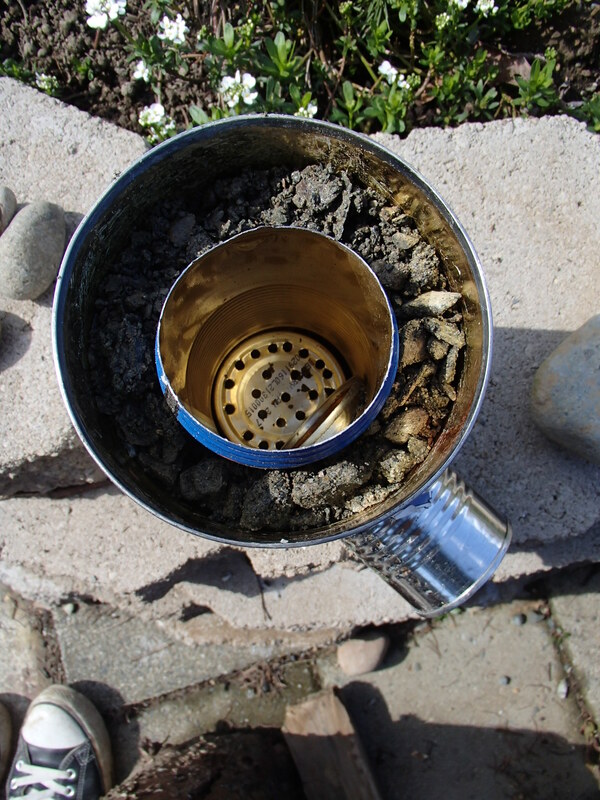 Hobo Stoves and Rocket stoves can be very handy in backcountry use. Note the wispy liner residue. Burn this off! While gas stoves are awesome, they lack the certain something that a campfire gives. Perhaps it’s the OCD satisfying effect of gathering and adding fuel to a fire, or the ambiance of fire light, the smell, who knows!? I’m sure though most of us can agree that camping without a campfire, just isn’t 100% camping. There are a lot of considerations of course: Fire regulations are there for a reason, and for the most part they include this style of stove. 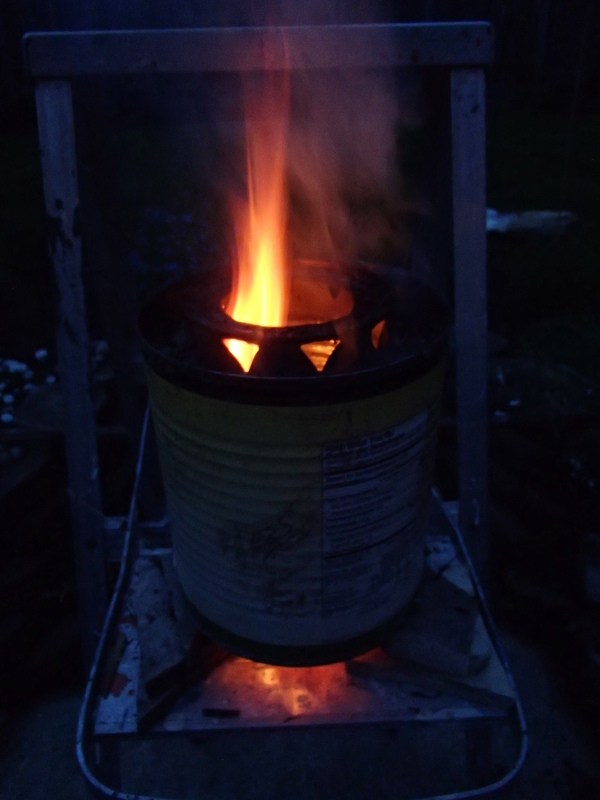 One man’s Rocket Stove is another man’s garbage. Be mindful, and be respectful. The rocket stove is a side loading, insulated stove. It’s hallmark characteristic is the “J” angle, with the elbow of the “J” serving as the place where fuel and air meet to create fire (Burn chamber). 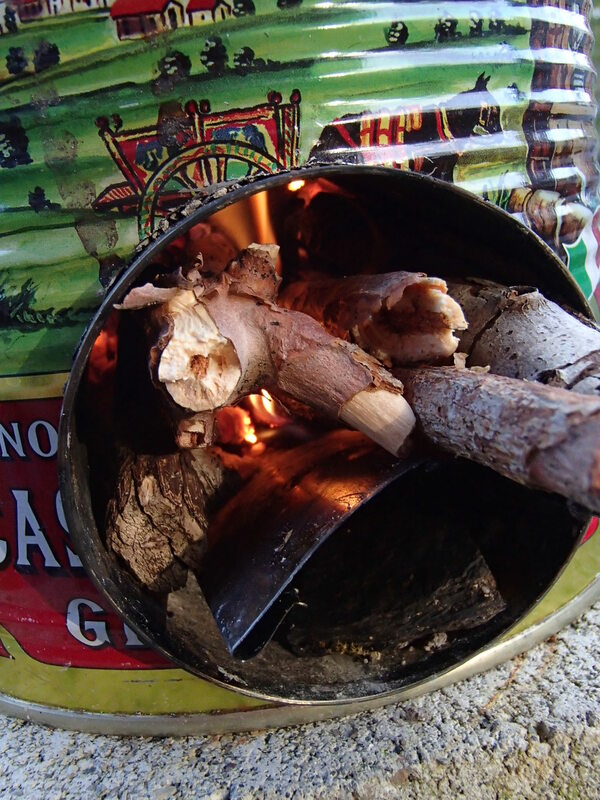 Being insulated, the rocket stove creates high temperatures which result in a more complete burn, and as a result makes very efficient use of a relatively small amount of fuel. Cut the top off of the #10 can, leaving the bottom intact. The other cans we will call “chimney” “burn chamber” and “feeder”. Remove both ends from the feeder and the chimney. Remove only one end from the burn chamber. Measure and cut an opening the diameter of your feeder into the side of your #10 and burn chamber. Try to do so in a manner that creates a slight downward angle. Try and make them fit snugly. To build the chimney you may need at least one other can. Cut the bottom ring off. With the ring removed cut a series of short snips (1/2in±) upward in order to flange the can to fit into the top of the burn chamber. Repeat this as needed (depending the size of your available materials) to bring the top of the chimney close to flush with the top of the #10. Cut a separate piece of metal from another can and fold it into a rectangle so that it will snugly bisect your feeder tube. 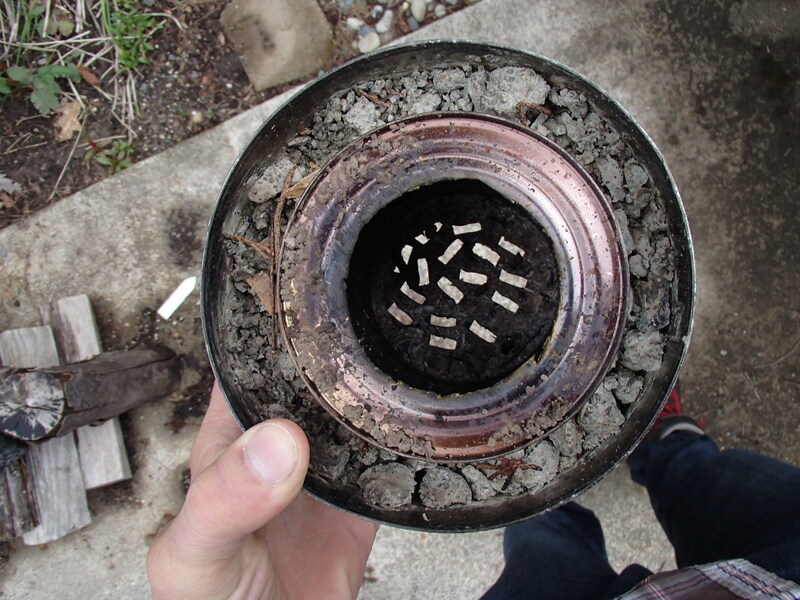 This acts as your air intake, if possible make it as long as the feeder/burn chamber is deep. 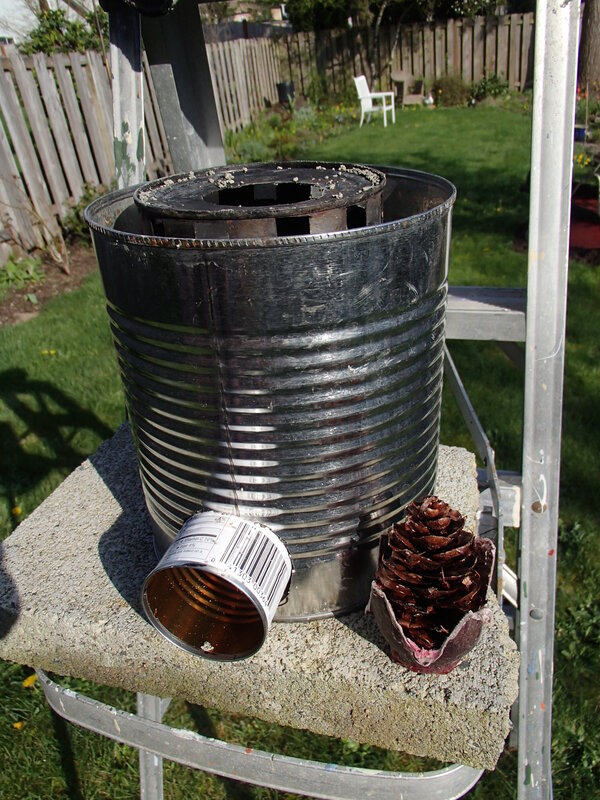 Use a can opener to punch holes around the top of your chimney, this will allow the hot gases to escape when you put a pot or pan on top to cook. 8. Fit the entire ensemble together snugly and fill the space between the #10 and your “J” with some sort of insulating material. Whatever is handy usually works, dirt, gravel, sand etc. 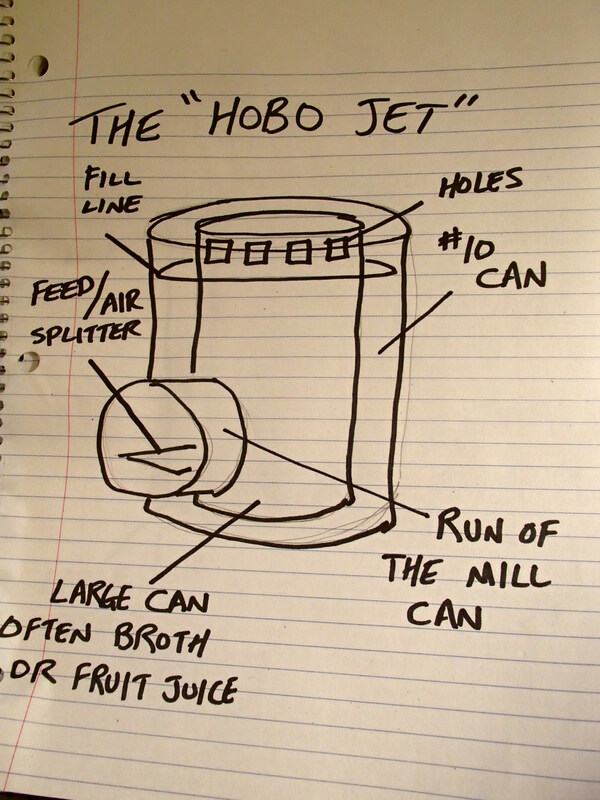 The Hobo jet™ is essentially just a rocket stove, but instead of using multiple cans for your burn chamber and chimney, you simply use a single large can. Usually these seem to be industrial size broth cans or juice cans. 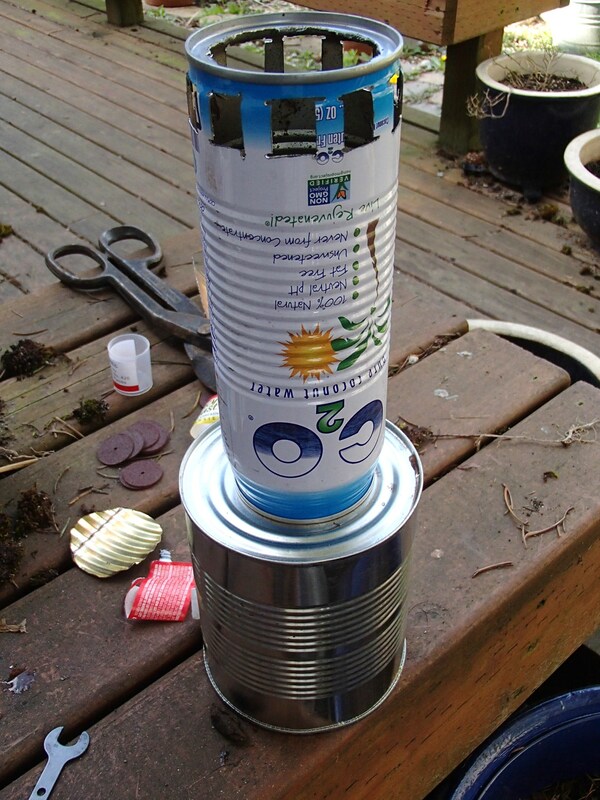 Although I have no real way to empirically measure the performance difference between the two, I’ve come to the conclusion that if you have access to the materials, this is the DIY rocket stove to build. If for nothing else, ease of construction: Less pieces=Less cutting. In fact, the only real downside I see is that because the burn chamber/chimney ratio is a little bigger, the Hobo Jet™ requires a bit more fuel, and perhaps doesn’t concentrate the heat the same way that a “tighter” rocket design does. 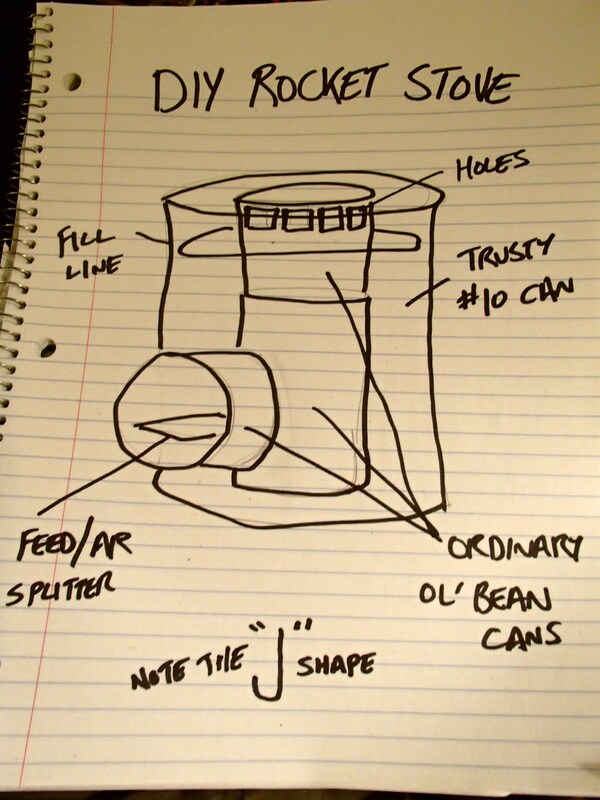 The Hobo Hybrid™ is my favorite design but…it’s not actually a rocket stove, as it lacks the “J” design. The concept however is similar, and the results comparable. 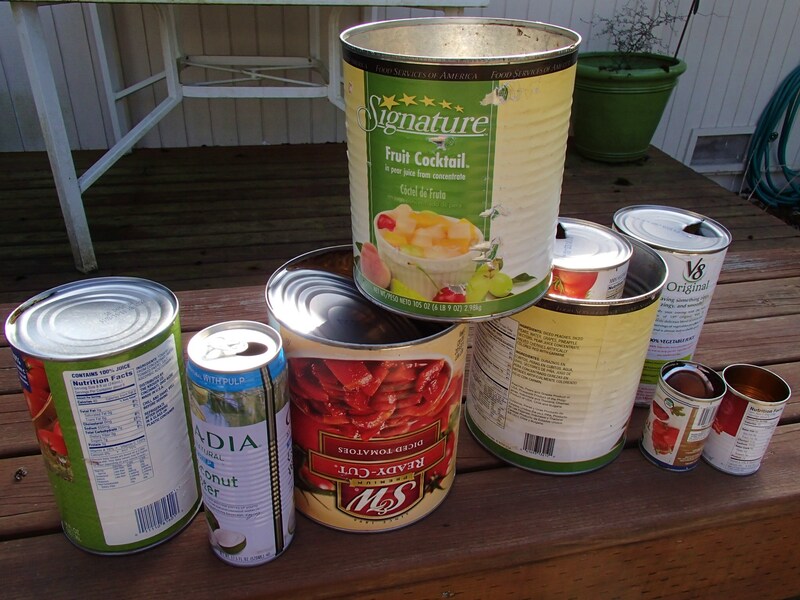 You’ll need a #10 can and a large broth/juice can. Remove top from the #10 and from the broth can. Measure diameter of the broth can in the approx. middle of the #10. Punch holes into the bottom of #10 within this circumference. In the “top” of the broth can (with the lid still intact) you may want to cut a hole in the top, or remove the lid completely (dependent on the size of the cookware you intend to use) Either way, use a can opener to punch holes along the upper edge to allow gases to escape. Center the broth can inside the #10 and fill in the remaining gap with insulating material. Burn baby burn! Again, give it a good long burn before using it for cooking to avoid nasty chemical byproducts. There you go, that’s it. Pretty simple design, and it does the job! If you screw around with the concept long enough, you will most likely come to your own conclusions. Which is part of the beauty of a project like this. This I thought would increase the airflow while freeing up space in the feed tube for more fuel, maximizing the concept ! I found that any real gains were negligible at best, and really the whole thing was a lot of work for little or no gain. Perhaps you can continue down this road, or any number of others and discover for yourself the future of the DIY stove! Oh, by the way, try using a Handy Dandy Firestarter to really light it up! Handy Dandy Firestarter at the ready! I want one and a place to use it.